We are engaged in manufacturing Herbal Chyawanprash, Ayurvedic Chyawanprash and Herbal Ayurvedic Chyawanprash, which helps in increasing the immune level. Ideal for all age group, these chyawanprash protects from common ailments like cold and cough. It is a powerful health tonic and widely catered to clients across the globe. We manufacture the Herbal Ayurvedic Chyawanprash. Chyawanprash also spelt Chyavanaprjasha, Chyavanaprash, Chyavanaprasam and Chyawanaprash, is a jam-like mixture of herbs, spices, and other ingredients, prepared as per the Ayurvedic traditions. It is widely consumed in India because of its health benefits. With the growing interest of masses in Vedic Sanskriti, Yoga, and Ayurveda, consumption of Chyawanprash has increased in India and abroad. This is the oldest commercial brand continuously used anywhere in the world. Various Indian holy books like Mahabharat Puranas etc, tell us that this formulation was first prepared by the ''Royal Vaids'', named Ashvini Kumar brothers, the twins, during Vedic times, 10,000 years ago Chyavan Rishi has created this formulation. He consumed for a long time and lived long without any disease; hence the name Chyawanprash came from Chyavan Rishi''s name. The first historically documented formula for Chyvanprash is found in Charaka Samhita, the ancient Ayurvedic treatisebook. It is a brown-coloured, sticky paste with the consistency of jam and a sweet/sour/spicy taste. It can be eaten directly or mixed with warm milk or water. It can be used like any other jam, spread onto crackers or bread. Chyavanprash contains Amla in big proportion. Other 30 herbs are incorporated. 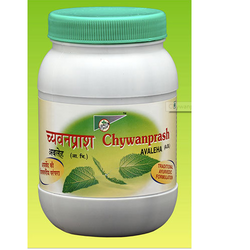 Chyavanprash is antioxidant improves immunity. Chyavanprash improves appetite, digestion and memory power. In the chronic cold, Cough, and sinusitis Chyavanprash very effective. It is recommended to the patients suffering from Tuberculosis and AIDS. Chyavanprash is a general tonic for all age groups.